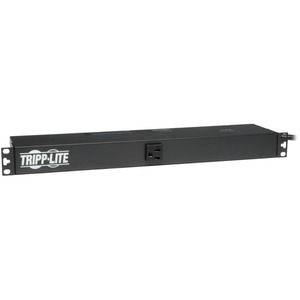 Tripp Lite's PDU1220T AC power distribution unit offers 20 amp, 120 volt capacity in a versatile multi-mount cabinet. Detachable mounting flanges are configurable for wallmount, under-counter or 1U/0U rackmount installation. 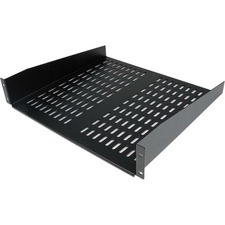 Uses only 1 rack space (1U) when installed in any 19 inch rack, with the potential for 0U mounting in the cable management area of most rack enclosures. Detachable flanges with pre-punched access holes and adjustable depth channels allow user configuration in dozens of potential mounting schemes. Attractive housing with 12 rear-facing outlets and one front-facing measures only 4 inches in depth. Unfiltered electrical pass-through without a power switch makes PDU1220T ideal for distributing alternate waveform UPS or generator power in rack enclosures, network closets and more. Includes 12 rear-facing NEMA5-20R outlets, 1 front-facing NEMA5-20R outlet, NEMAL5-20P twist lock plug, 15 ft. AC power cord, 20-amp circuit breaker, grounding lug and rugged all-metal case design.